There are options galore in curly designs, colors and highlights -- giving you endless combinations -- and the "how-to" tutorials help you achieve your chosen style! Once you've completed your look, you can save, print or share the final result (your private gallery of saved images will build up fast). The catalog offers something for everyone -- including over 600 updos and half-up designs! With your uploaded photo in place, just search for the length, texture or type of haircut you need. You can also access Wizard mode under the consultations tab, and instantly try hairstyles and colors based on your facial shape, eye color, skin tone, hair characteristics and other data you enter. See all features or try it here. You'll find hairstyles for any attitude or lifestyle, for women over 50 (or 30, 40, 60, 70...) for teenagers and for any occasion! If you need help or have questions, click the blue "Help" button -- or, customer service is ready to assist. The Hairstyle Selector makes it fun and easy to change your look online with curly hairstyles! 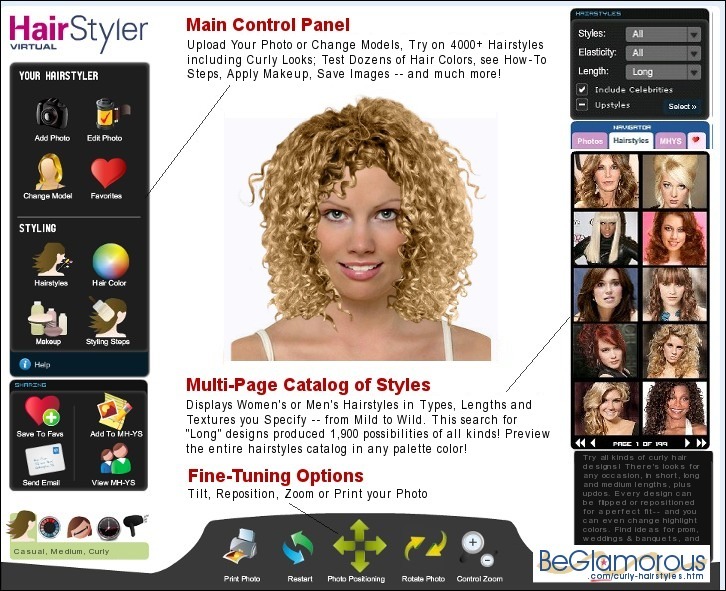 The Hair Style Selector (which also serves as a curly hair app) lets you compare women's and men's perms of all types, textures and lengths, for any occasion - everything from conservative to wild looks - plus 50 hair colours and over 30 highlight hues, plus virtual makeover makeup palettes. The Hair Color Chart (or Hair Color Palette) is accessed in the left control panel. On the internet, people often search for hairstyle pictures or haircut pictures, to get inspirations. 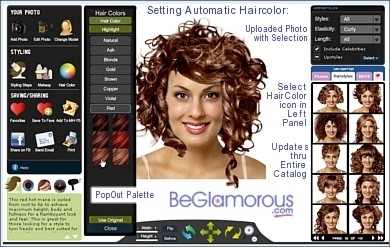 This tool lets you try hairstyles on yourself, in short (including short-short, very short and super-short), long or medium lengths, in curly (whether natural or with hot tools such as curling iron or curl rods), straight or wavy textures, hairstyle choices such as black/African-American, celebrity looks, cute, updo or semi-updo, half-up / half-down, new & trendy, quick & easy, for girls/boys/guys, new & modern, funky, for all types of needs (fine or thick hair, styles for 'older' or 'middle-aged' persons, etc). This online software program is amazing (you can do basic editing on your uploaded photo to prepare it for usage; most hairstyles offer tutorial tips for diy styling at home. The site does not offer services such as free makeover games or downloads). If you wonder "would I look good with curly hair" or "how would I look with curly hair", this comparison tool lets you see yourself with curly hairstyles from tight to boing-y, or get an idea of how wet weaving or human hair extensions would change your appearance.